It’s time for a new pattern! :D This time I’ve been working on a gift for my brother in law, who loves pokemon and asked me if I could do a Snorlax for him. It was very anoying to design his body shape, but, for now I’m satisfied with it xD Maybe in the future I will try to improve some things on this pattern. It is a huge Snorlax! He measures 18 inches (46cm). A wild pokemon is blocking the way…. – To make the eyes, mouth and teeth you will use the felt. **Work using only hdc (half double crochet). ** When stuffing use a lot of fiberfill, it should be very full. **Don’t stuff it too much. Mold it a bit to give the right shape. **Stop working in rounds. Start working in rows. **Edge: Make one round of sc around all the belly. Row 7: inc, sc 18, inc (24). **Now you will make one of the two triangles of his face. Attach the yarn on the 11th stitch of the Row number 16. When you finish it should look like that. **Edge: Attach the yarn on the first stitch of the first row and make one round of sc around all the face. Attach the yarn on the first stitch of the first row and make one round of sc around all the face. I did not created this character, Snorlax is copyright of Nintendo!! Hey Summer and thank you for replying. The reason I got so upset was because I already overcomed all of the errors in this messed up pattern and got to finish the body, the head, the ears and the hands. Which means I wasted A LOT of yarn and precious time. And when I got to the claws and saw how IMPOSSIBLE these are I was just frustrated as hell. I literally left this whole project for a few months and couldn’t even look at it. But my son do deserve that I finish this for him. He is not the one I should blame for this messed up pattern besides this blog owner who is so disrespectful to her readers that she can’t even answer people’s questions (and there are a lot of them due to the fact that this pattern is messed up) so I figured I will just try and do some other claws and keep going with the body and the head patch. After I will be done with this pattern be sure that I will never ever do another pattern from this blog or one that was written by this blogs owner. I definitely learned my lesson. Anyways, thanks for the attention I truly appreciate it. Hi I was wondering what your adjustments were for this pattern? I’ve attempted the body and the face and both are not coming out right. If you’d be able to share how you fixed the issues I’d really appreciate it but if you didn’t write it down then no worries! Me as well, like a lot of you, had a problem with round 6. I found that at the end of the round, instead of doind 4 sc, inc(twice), I did 3 sc, inc(twice) and it gives you the 90 stitches like the pattern said it will. Maybe its a mistake in the pattern (I treid doing this row twice and each time it was 92 stitches AND it got on top of the first slip stitch of round 5) but this is the way to move on to round 7. Worked for me. Basically, when you find something that is not going right for you, try adding a stitch or removing one. That’s what I did and it worked great for me. I hope this helps and let me know if you have other places that you had problems with I will try to help. I already finished the body, the arms, ears and head. If I can help I would be happy to do so. Thank you so much Marten! This pattern is totally messed up. Everyone (!) gets stuck on round 6-7 AND the hand claws are absolutely impossible to crochet. After wasting SO much yarn (and time!) on the head, body, ears and arms makes me really upset to just give up! You should update this pattern instructions instead of making people wasting precious time and yarn! Seriously! You updated your blog but can’t answer questions anymore?? What is up with that?? I AM VERY UPSET! Now I have to find an alternative for the claws Since this pattern for the claws is absolutely IMPOSSIBLE! Thanks a lot for wasting my time! I’ve found that stitches are sometimes miscalculated but just fudge it slightly so that the number of stitches matches the final count for the row it’s fine. It’s really minor errors as far as the body and such goes. The hand claws I’m also having trouble with though. At row 7 everything falls into place if you do this^. There is 1 stitch off in the pattern she wrote in row 3 that will literally create so many problems throughout the body if you miss it. It is a very small oversight and most experienced crocheters will automatically make the adjustment for it without even thinking about it. This will help you immensely. My husband has made 2 of them since I made the corrections with no problems at all. 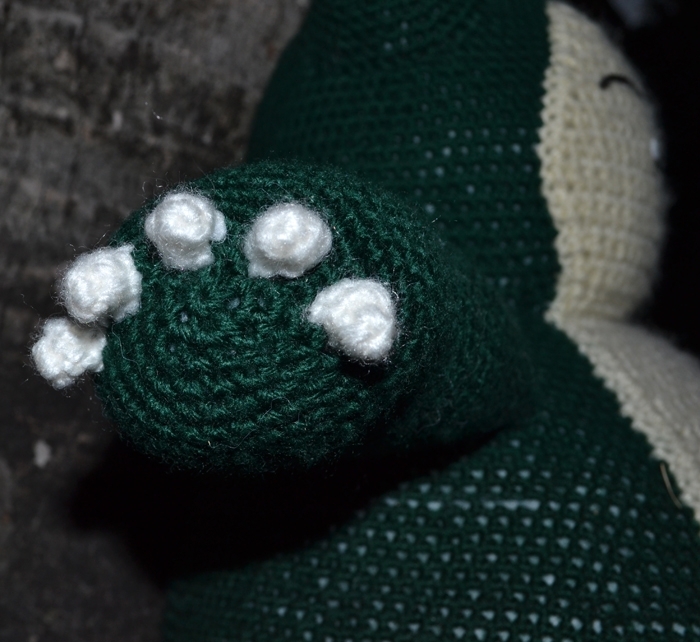 Hope you can help, bur thank you for sharing your pattern! The 2.5mm is only used for the claws the rest of the pattern is with the 4mm. How can i’ve 20 sc at end if 1 inc (2sc) + 14 isc + 1 inc (2sc) = 18 sc ?? I hope you can help that little french girl who am i :/ ! An increase is increasing the number of stitches you have. That sc14 should be a sc16. I’ve found a number of minor errors like this throughout the pattern that make a huge difference. 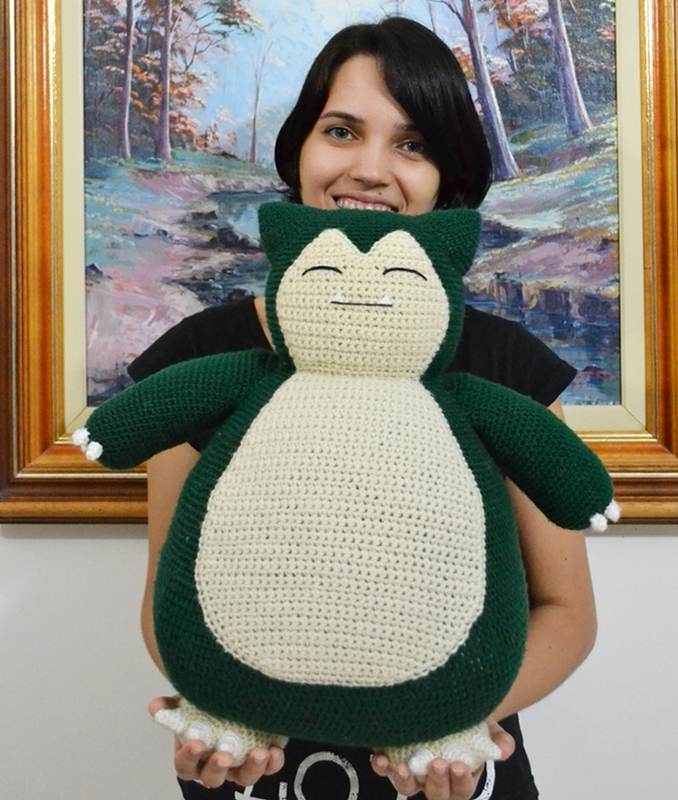 Thank you for this awesome pattern 😊 I finished my Snorlax and I’m so pleased with him. I wish I could share a pic! Hi, what is it that you are stuck on? it’s the body round 6.. somehow i always end up with 90 than 92.. i was hoping maybe you can send me a tutorial just up until round 6 if you’re not busy and ok with it.. of course i won’t force you to..
Hi, all I can suggest is that you make sure you have the right number of stitches on your previous row before you try row 6. I think at this stage, doing a video for you probably isn’t going to help as you’ve gotten this far, so you are doing it right. Also if you are REALLY struggling to get the right number of stitches and get beyond this point, why don’t you add 2 stitches to your round by doing 2 extra increases somewhere in your round, I doubt you’d notice in the finished piece 😊 at least then you can move on. When I was struggling with getting the right number of stitches in my rounds, I used a stitch marker to mark the start of each round, so that way you know for sure you are joining your round in the right place, and not gaining or losing stitches. I hope that helps. You still need help with round 6? If so, read my last comment here. I figured it out. This pattern is so confusing! How in the world do you even start round one of snorlax??? It says to chain 30, then sc 28 from second from hook, 3 sc in the next chain, sc 27, 2 sc in the next and slip stitch… so how would you put 28 sc in the same stitch without being scrunched up??? Can someone please help?? Thank you! You do your 30 chains, turn, skip the first chain, then SC once into each of the next 28 stitches. Basically you are crocheting in to your foundation chain. In rows, like if you are making a scarf or blanket. For the arms, belly, and face it doesn’t say to chain for the rows, are we not supposed to or does she take it for granted that we should just make a chain between each row?? On the belly only the first 10 rows start with the chain 1… everything else is worked in a continuous spiral. I recommend a stitch marker in the first stitch of your row to help keep track of where you are. Can someone help me? I’m stuck on the body round 6.. it’s says the total is 90 but when i count and crochet it the total is 92.. how is this even possible? I tried to just continue but now i’m confused on where to slip stitch since the current slip stitch and the last slip stitch doesn’t match up..
I’ve been putting a stitch marker in the last and first stitch of each round to make sure I slip stitch into the correct stitch and don’t accidentally create additional stitches in a round, I did the exact same thing and ended up with too many stitches as I hadn’t been joining in the right stitch, as you basically end up with 2 tiny stitches (your slip stitch and your ch1) that you shouldn’t be crocheting in to. I hope that helps. no.. i’ve counted the last row.. it was exactly 84.. but somehow when i crochet round 6 it always end up like this even tough i always use stitch marker.. can you please help me? like sending me a video of how it’s done? just up to round 6.. i really need to make this for someone important.. Tried the body 3 times now and every time when I get to round 2 I get more stitches than I should have 68 instead of 66) 3 times!! Can anyone plz help me with this problam? Thanks! When joining rounds you need to skip the last stitch in each round and slip stitch into the first single crochet not the starting chain. Alison, thank tou so much. Without your answer I would not complete the body or continue on this pattern at all. Thank you very much!! Thank you so much for showing the pattern, my boy really love it. Can you tell me how many balls you have used for each part? HELP!!! I don’t understand how to start the body…. I have read all the comments but can someone please send me a picture or video of what it should look like? I just don’t get it!! You start as an oval. Ok, one MAJOR flaw of this pattern: you say to CONNECT the row at the beginning but that’s not how you do it in the video. Please fix this. I had to redo mine 3 times! What video? I’m making one and stuck at the belly part. Would like to know if there is a video for this. Whereabouts did you find the video?? 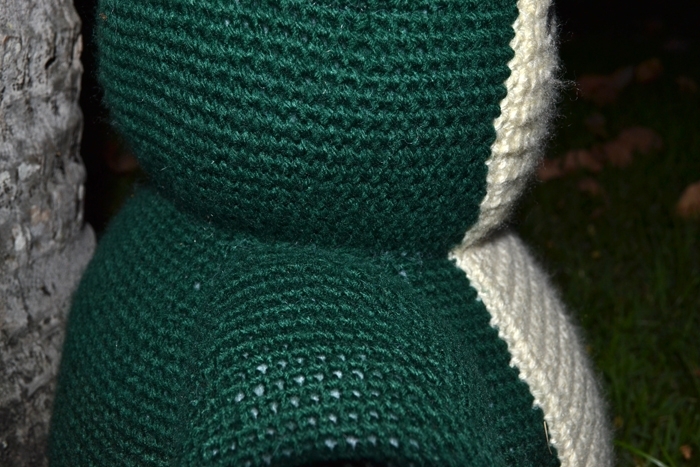 How many meters yarn is used for the green/main work? I want to know how many skeins to buy. Hi, I really want to make this, but I’m not following how you start. I’m used to using a magic ring or something similar. I don’t understand what to do after the very first chain 30. Any help would be very much appreciated! You start with a normal chain and crochet around it to make an oval. 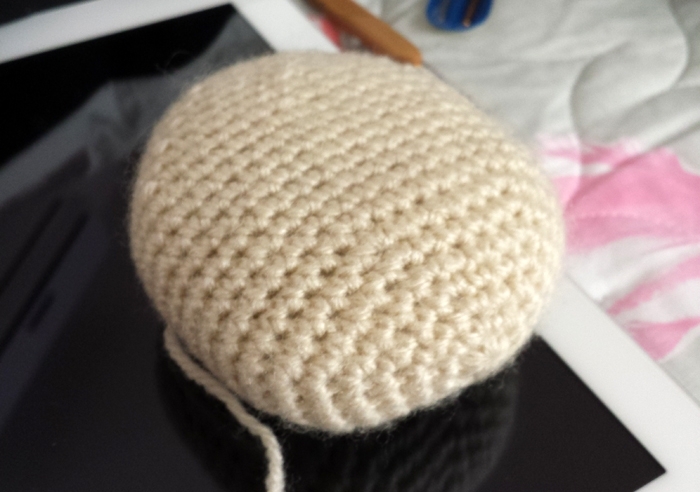 Then you continue crocheting in the round. Does that make sense? I’m in the same trouble as Emma, if you do as you say, won’t there be a hole in the base? Crochet up the chain and then down the back side of it. Hello im stuck on round 11 not sure how to do it ik how to hdc n inc so i hdc 18 n then inc 120? The (120) is how many stitches you will end up with in that round after you repeat the hdc 18, inc around. can you share snorlax patern for keychain? In round 6 I got 90 but there were not enough stitches to complete it as it said in the pattern. After the 27 sc I Inc then sc 4 then Inc again and sc 2. I ended up with 90 but not sure how it’s going to effect the pattern. I have the same problem too! In round 5, I couldn’t fit the last sc before the slip stitch but when I counted the stitches I have enough. Thank you for sharing. Easy to understand. Well.done. i really love this pattern but i’m having a problem with row 6 of the body, i’m not sure where i’m going wrong but i keep coming up with 92 instead of 90. Is there anyway you can help on figuring this out? I actually am finding there’s not enough stitches to do row 6 the way it’s written. Did you figure it out? im confused. do you start with a normal chain or do you start with a magic cirlce? You do a chain and crochet around it to create an oval. Hola… Estoy teniendo problemas con el brazo En la fila 33 se hace 21 disminuciones?? yo tambien estoy teniendo ese problema… pudiste resolverlo? curious how long this took you total to do? How long do you think it would take someone who is new? Hahaha I didn’t understad the begining 😂😂 but now I feel stupid haha. Thanks for the pattern! WOW!!!! GREAT Snorlax!!! What a gift to share with the all the Pokemon gamers-stitchers!! Thank you, very much!! Poppy in Georgia..MERRY CHRISTMAS & Happy New year!! 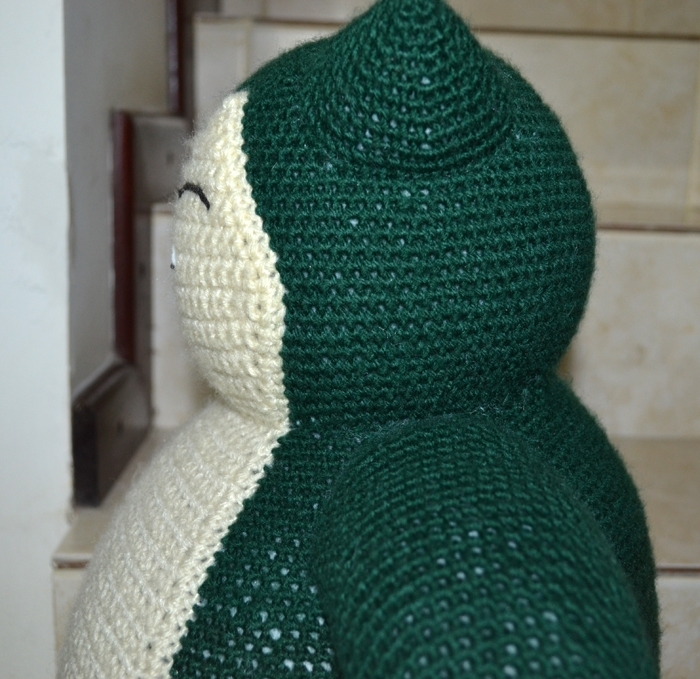 Thank’s for you sharing , when my son seen this snorlax , he very happy and want it So i will do this for his Christmas present..
Hi, I tried to start this project, but I am sort of new at crocheting. -When I start joining rounds, am I making a circle? And how does a 30 ch become 60? You crochet around the chain. When you look at the chain, there are 3 lines of yarn: one loop (2 lines) and the back line. So for the first 28 ch, you sc 28 in each LOOP. Then in the remaining chain (the first one you made of the original 30) you sc 3. Then you continue around to the second chain of your original 30 and sc 27 in the back line (behind the loops you already made scs in) until you reach the last ch (ch 29 of the original 30) where you sc 2 times. 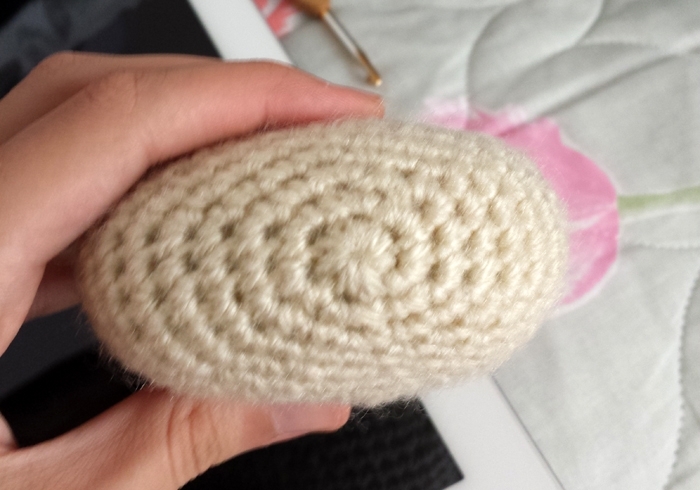 Then you continue around crocheting in the round. I’m working on this project as I type. Have the body, head and wars finished. I realized shortly after that the same question had been asked and answered below, but your reply really helps as well! I got the head and ears completed, now to tackle the body! Hi Mia, thanks for the crochet pattern. I’m in the midst of doing it and currently stuck at belly part. Do I go rounds or I sc one and turn over ?? Did you figure out I am struggled here too now. Hola, no se si les servirá el dato, pero el patrón esta bien. Es normal que se pierda la forma. Acá tienen un ejemplo de como va quedando, la foto perteneces a MOM’S ANGEL HANDS. Espero que no desespereis en el intento. Yo iba por el 6to intento, cuando esa publicación me salvo la vida. Saludos a todos.! Just wondered when in the pattern the body starts to take shape I’m half way through and it’s still an oval I don’t seem to be going up at all! You should have started to build up the “walls” of the body at round 11 from then on it will grow out and up at the same time you should be able to actually see it by the half way point, round 30 or so. But it does continue to grow out as well, which may be what’s throwing you off. I have a question on Round 38 for the body section. How do I crochet 78, then crochet 4, then decrease, repeated 13 times and still end up with 143 stitches? Or am I reading the pattern wrong. I’m so far into this now, I would hate to make a mistake. Thanks to anybody who can help! yo tambien quisiera saber como esta eso… ya lo hiciste? cómo era? I want to know too how to do the arms… did you do them already? I had the same issue.. I just added the remaining stitches needed to complete the row. It all adds up while you advance through.. I’m on row 26 and it all works out as long as you have the amount of stitches that the row is suppose to have..
Row 4: you’ll end with (78) stitches.. So just add stitches to make (78). And so on with the other rows.. Hope that’s helps..
My problem is that I’m ending up with too many stitches some how. I fixed it by decreasing a stitch and modifying the beginning of each round in the first 10 rounds. It’s working out so far! 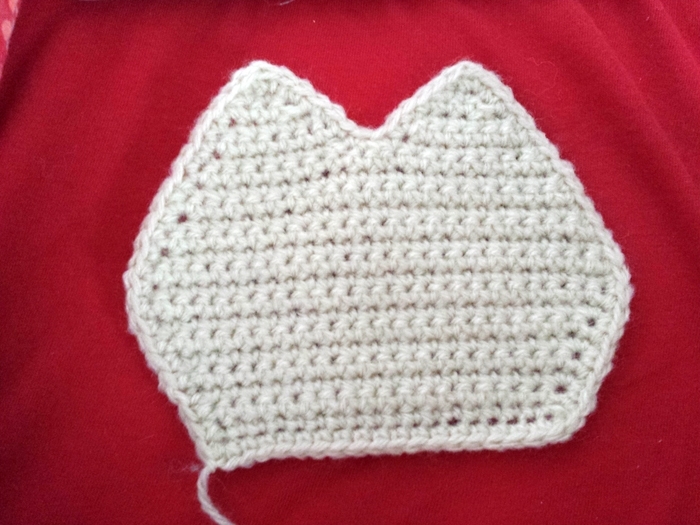 Love your pattern I have a couple of questions first when attaching the ears what row are the attached to? The same goes for the white of the face and belly color? I was wondering if you can do a video tutorial on this. I don’t understand by reading the pattern bug I understand by watching the video on how to do it. Please make a video. Thanks an advanced. I would like to request this as well! I would be willing to donate for you to create a video tutorial step by step. I really wanna make this but I am new to Crocheting and reading patterns. Hello, I realize this is an old post, but hoping someone can help me. Should the increases and slip stitches always be at the end of the “row” or am I doing something wrong? I’m getting these “lumps” in the middle of my oval (I’m only on round 6 now) and I’m wondering if this is how it should be before I continue working and it end up being wrong. Thanks for any help!! I’m having the same issue. Did you ever figure it out? Hi, Nunziata! 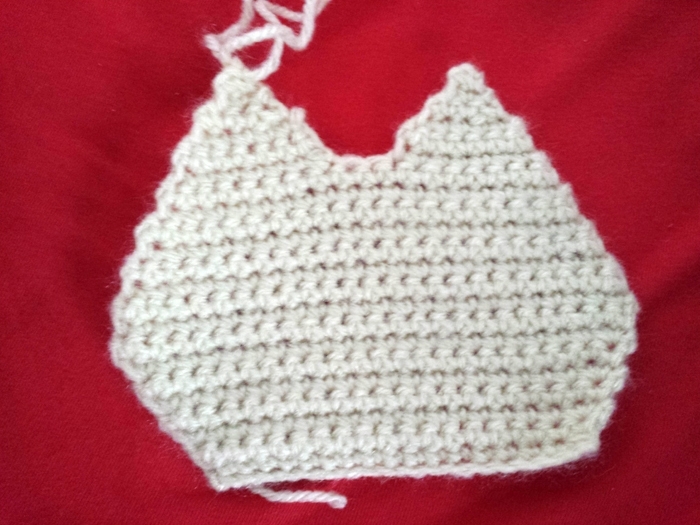 I got frustrated and ended up doing all the other parts first, but what I was doing wrong on the body was only crocheting, say 18 then increasing and considering that my row! So silly looking back. What you need to do is crochet 18, increase, crochet 18, increase, etc until you get to the end (I’ve been placing stitch markers!) I still have little places that “lump up” but I’m assuming they will correct themselves as I continue on in my work. Hope that helps you! 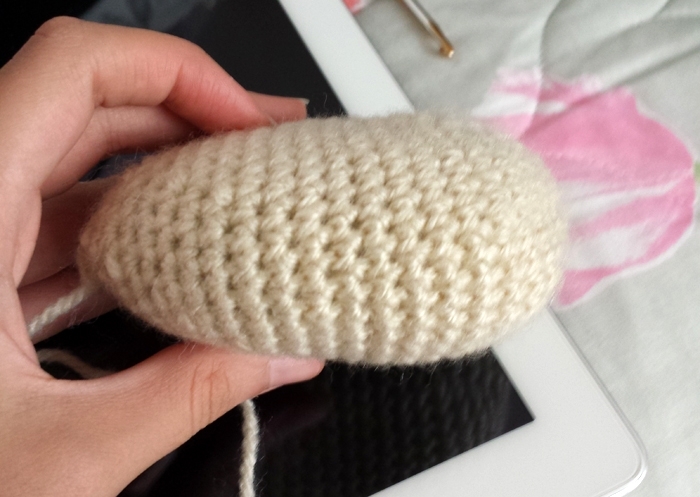 I suggest also looking up YouTube videos of the stitches/amigurumi for help! I’m somewhat confused in regards to the arms pattern. I’ve never gone from rounds to rows, and I’ve never moved up without chaining one, so how would one do that in your pattern? When you do the rounds don’t slip stitch and ch1 just work in a continuous spiral. When you get to the switch from rounds to rows, after you complete the 42sc for the last round you then ch1 and work the 21sc in the opposite direction. After you hit 21 turn and ch1 to start the next row. I really really love this pattern, thank you so so much for sharing it! I do have a question about the amount of yarn I need for each color. I know that the green will be more used than the cream but do you have an exact amount, or at least and about amount? Thank you so much!! I don’t know if this helps, but so far I’m starting on my 3rd skein of green/blue (268 yd skeins) and I’ve finished the arms, ears, head, and part of the body. For the cream, I used 2 skeins of 120 yds. And for the caramel foot pads, I used leftover yarn I had in my stash! I crochet pretty tightly, but hopefully this helps. I love looking at things like this and get amazed. Hi this is adorable! 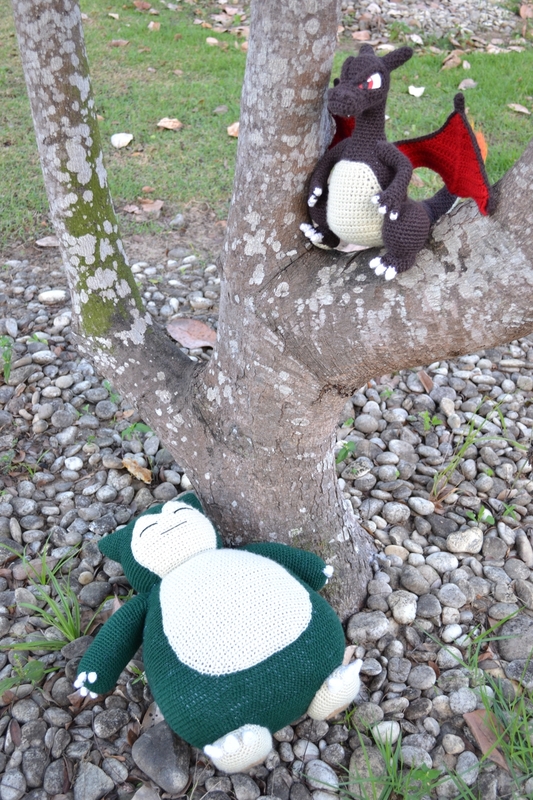 I was wondering if this pattern of snorlax could be made in a way smaller version? 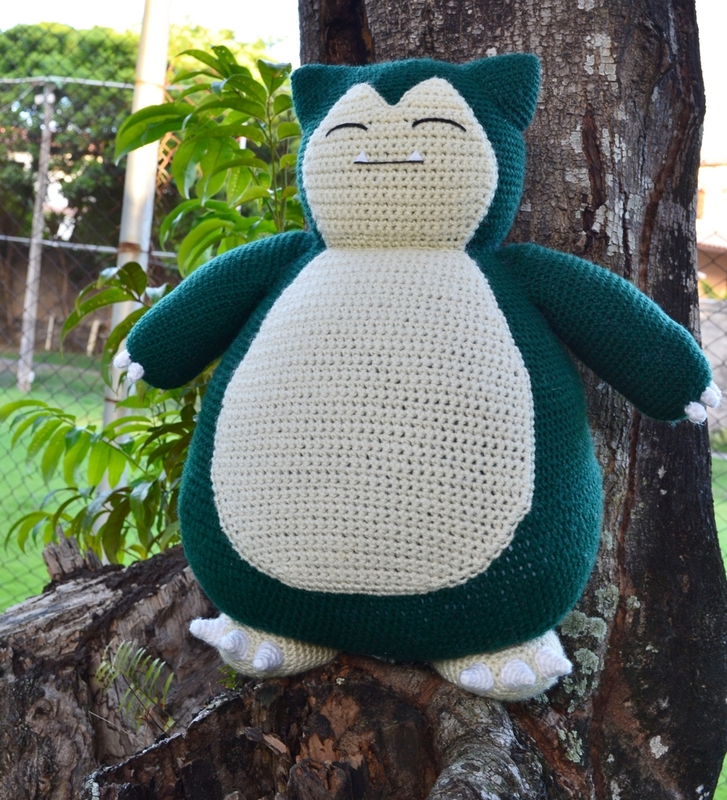 :/ My son wants about a 3 inch crocheted snorlax…Got any suggestions..
For that small I think you’d have to go to a doily hook and crochet thread which would be immensely difficult unless you can find a different pattern for one. With regular yarn you could probably go as low as a 2mm which would cut the size way down but I don’t know that you’ll ever get it down to 3″. I have a question… I have to do your Snorlax but in 25 cm (like 10 inches) i tried changing the hook and yarn but it still too big. Could you help me, please?? Or anyone who read this?? 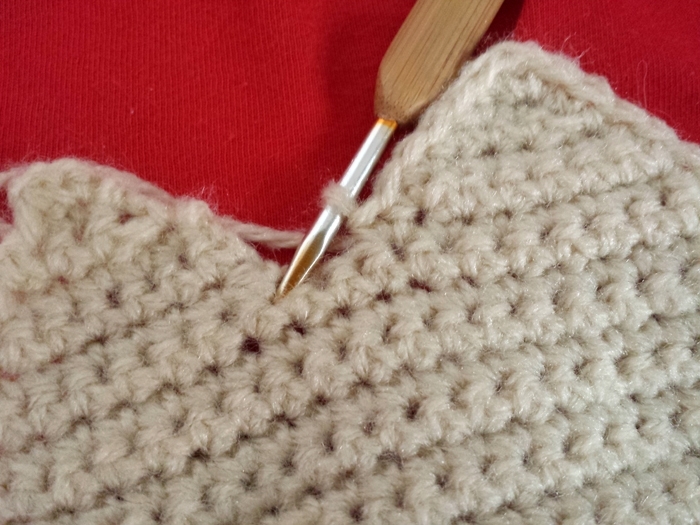 Have you tried switching to crochet thread and using a steel hook? That’s all I can really think of. I’m not sure how small a hook you went down to but try a 2mm for the body and drop down to a doily hook and crochet thread for the claws. I’m having the same problem. Did you find the issue? Did you figure out the problem? For round 6, i counted a total of 93 stitches, not including the ch. 1 or the sl st.
Lol we will never find out. Did you ladies figure this out? I’m stuck. 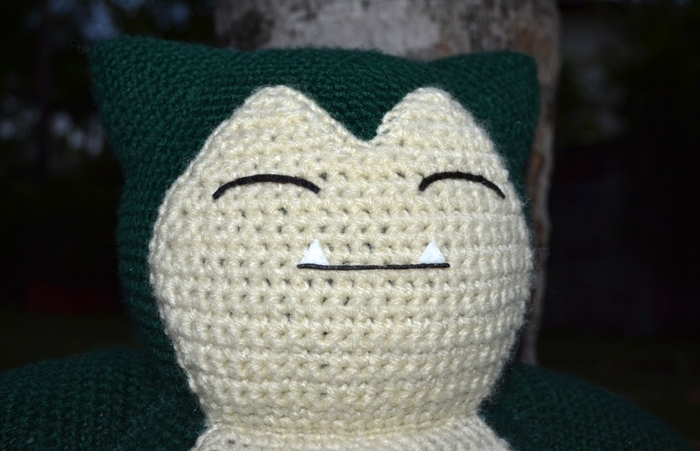 what i did was sc 25 instead of 27, and took out the last sc before the sl st.
No clue if you’re actually looking on here still, but I’m actually crocheting a Snorlax from your pattern right now! I’ll be turning it into a backpack/bag, which will fit in nicely with the current Pokémon craze, I think. :) Thank you for the lovely pattern! I am currently on round 11 on the body and I’m stuck on what increase I should do. I am supposed to do 2 single crochets in one stitch or 2 half-double crochets in one stitch?? Thank for the amazing pattern!! 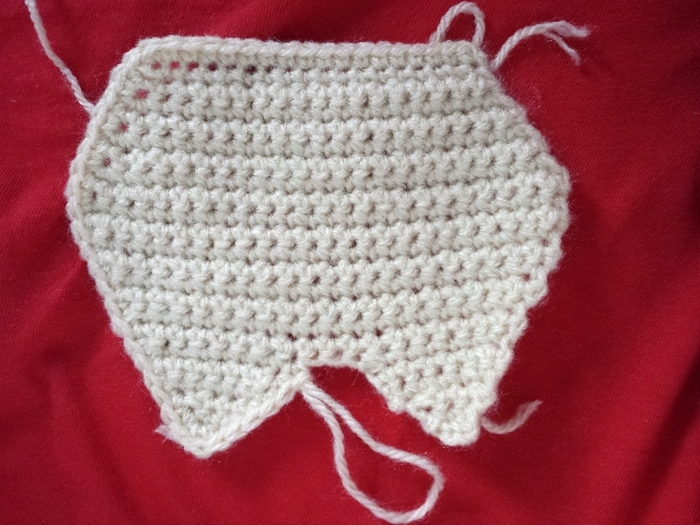 Round 11: hdc 18, inc (120) –> Looks to me like it’s 2 half double crochets since from that point on everything is hdc until mentioned otherwise :) That approach has been working pretty decently for me at least. 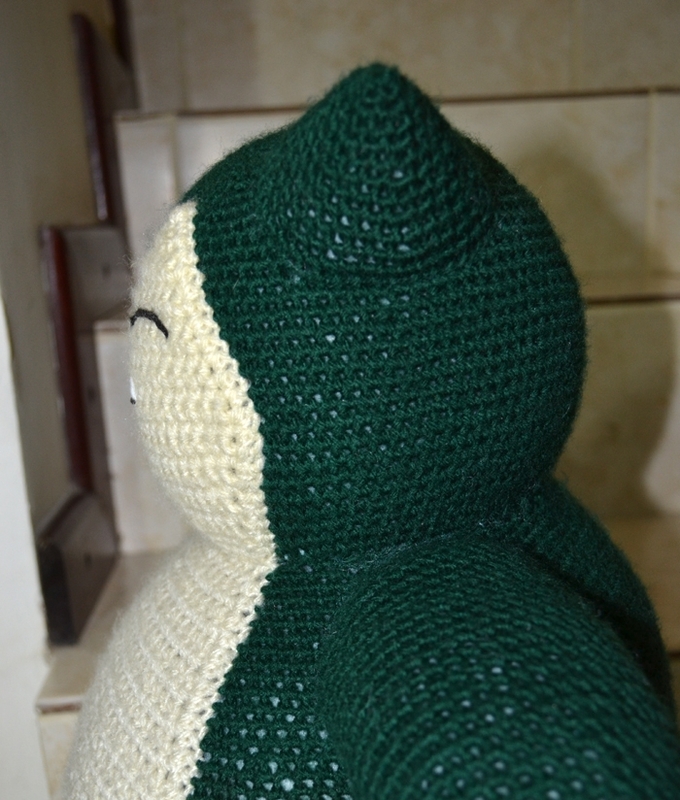 Gente alguém me ajuda como que faz  eu quero fazer o snorlax mais não entendo isso de rodada…sou novo no croche !!! Comecei semana passada pra ser mais específico !!! E tipo vi ele é me deu maior vontade de fazer pra poder ter um !!!!!! Alguém por favor me ajuda !!!! Meu whatsapp tai +5512982253530 por favor gente quero muito fazer ele !!!! whoops, I read some of the comments and posted my question. Then I read in one of the later msgs that it is about an oval shape. Sorry for the needles question. sc in last ch, sl st (60). With your instructions I don’t know what to do with the 27 sc and the 3sc and the last increase. It seems to me I’d be doing them in the air. I hope I get my message across. In order to get the 60 sc you will be working around the chain, 30 will be on one side and 30 on the other. to get an oval shape. With regards to the 27 sc and the 3sc, she just meant to state that you do 27 sc and then sc, it was confusing for me too, but it you count your sc, at the end they should be adding to the states sc of the patter instructions. Thanks Maria I didn’t get this either! Hi I love the Snorlax you’ve made and I’m on my 3rd attempt of this pattern and I definitely think I’m missing something in reading this pattern. At the end of row 5 (this is my 3rd time going from the start to this point) , after the “(sc 3, inc) twice” and before I slip-stitch, should I have still have 3 sc’s between the final inc of the row and the starting stitch marker of the row? If that makes sense..
Every time I’ve tried this pattern I get to about row 8 or 9 and I come up short every time with a few empty sc’s between the last stitch of the row and the start of the round and I’m wondering is this supposed to be like this? if you count the total number of sc in round 5 there should be 84. I love this but this pattern its driving me crazy! Thankfully after 2 hours I read through the comments and figured out that this was supposed to be made in an oval shape. Has anyone rewritten this pattern? Also getting confused with all the (sc, 2 inc) type of add on’s. Is it a single increase or is it a sc, then an inc? I’m soooo lost. Wanted to surprise a friend for her birthday but I’m ready to give up. HELP! (sc, inc) means one sc followed by an inc. You can usually figure it out by counting the number of stitches in the previous round. about round 38 of the body; I don’t understand what I’m supposed to do, dec yes, but how? do I make 78sc and then dec 13 times or what? could you explain a bit? thanks! This means you first sc 78 and the make 4 more before a decrease, then it would be repeating the 4 scand decrease until the end of the row (making 13 decreases in total ). Hope this helps and that I wasnt too late replying. this is a lovely pattern but I am having some trouble figuring out how to get started on the body. Could someone please explain that a bit more for me? Thanks. Not sure where the problem is for you so I’ll start from the very beginning. This will work in an oval shape. So you will ch30 and starting in the 2nd chain from the hook 1sc in each of the next 28 chains, the sc 3 all in the last chain which will now allow you to work back up the other side of the chain placing 1sc in each of the next 27 chains opposite where your 28sc are then do your 2sc in the last chain(ie your first sc on the other side.) Then slip stitch into your first sc. And move on to the second round. Can someone break 11 and 13-14 down for me? I’ve looked all over a lot of different websites, and there’s a lot of conflicting information. Does 11 mean do 18 half double crochets and then one increase? If so, why does it say it ends in 120 stitches? I’m not sure how you do 18 hdc and an increase and then get (120) as a result. And I have yet to find a video that explains what hdc in each hdc means. Does this mean to go back and do a half double crochet in the half double crochets you’ve done already? Sorry, this is the only part of the pattern that I can’t make sense of, and I’ve searched around a fair while trying to see if anywhere else explains these things. Actually, I think I have the first part of the question figured out since 18 hdc + inc = 20 stitches times 6 = 120 total. And I’m assuming hdc in each hdc just means to go around for a total of 126 stitches for 13 and 126 stitches for 14? So my last question would be where the sc in each sc comes from on lines 26-37 if it was all hdc’s before that? Again, sorry for all of the questions. I’m used to formatting in an old book I’ve been using so doing patterns that people are used to online is a bit of a new thing for me (got most of it, but I’ve had a bit more difficulty in doing this pattern as you can tell). Sorry if this reply is too late, you are correct in assuming that hdc in each hdc means you will be working the same number in the next row. So both row 13 and 14 will have 126 stitches. As for rows 26 and on, she has written the pattern to go back to using the sc. Row 25 will be hdc and 26 will start using sc. How many yards did you use for each color did you use in the whole project? I’m not sure how much to get going by how many grams. Just a quick question with the pattern (I’m somewhat new at crocheting), starting at round 11, it says hdc 18, inc (120). Does this mean do hdc 18 and inc hdc until 120 stitches are made, or is it something else? Thanks a bunch for coming up with this pattern! i love your pattern, im currently on the arms, i have a question about arm rounds 7-18, it says 4sc, inc. do i do that for all of them, i just cant make out how it will end up as ive done rounds 7-18 like this and its massive D:. I meant to make a comment when I had the same problem – I did the same thing Lauren did, but when I realized it was spiralling out so large, I knew it had to be wrong. I pulled it all out (argh!) and then ended up doing the 4sc, ins ONLY for the 7th row, then did 8 through 18 did the same number of stitches I ended up having in row 7. It looked okay doing it that. Hope that was the right thing to do and that it helps! I have a question. What does it mean to join rounds? 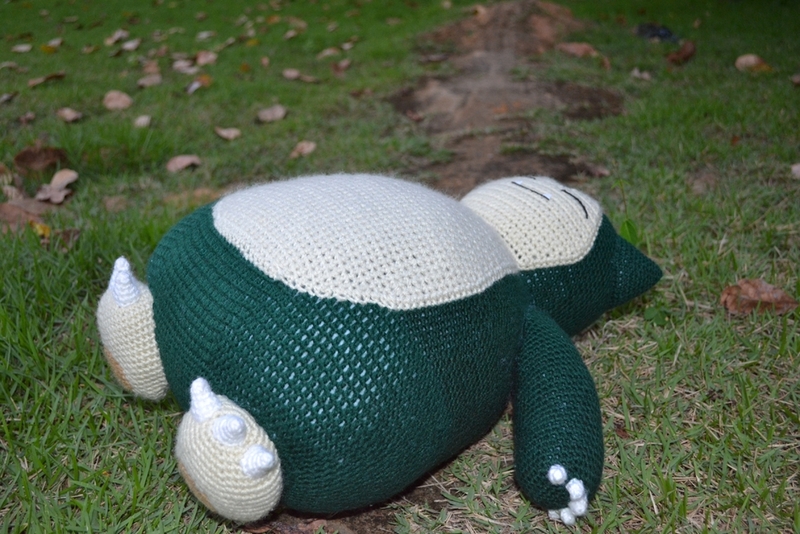 Sorry I’m kind of new to crocheting but I need to make a snorlax for someone’s birthday…. Can you give me some tips? And where can I go to figure out what the symbols mean? So rows 1-10 once you’ve completed the last stitch in the round you will do a slip stitch (push your hook through, yarn over, pull through 2) into your first sc. Be sure to not go through the slip stitch from the previous row or the chain 1 from the beginning of the row you are currently working. Here is a link to my fb post with his pic: http://on.fb.me/1AlRE7d If you can’t see it, or want more pix, give me a shout. He stands 28 inches tall and 49 inches around the middle. I ended up using a different approach on the claws (basically they’re mini ice cream cones! ), but everything else is your pattern. 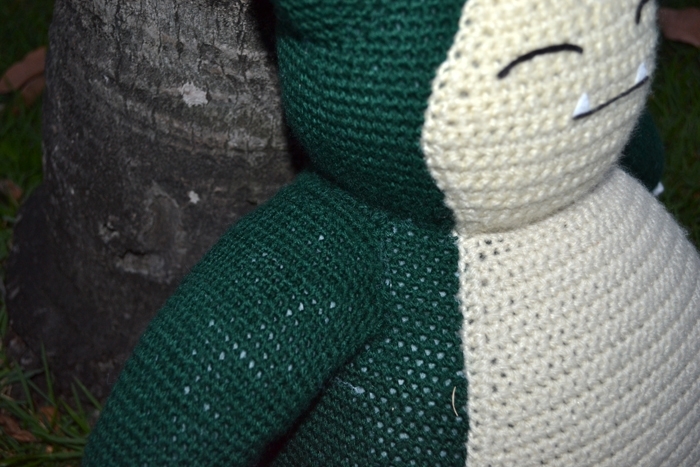 Thank you for sharing this pattern, its so cute and the most realistic Snorlax pattern I’ve found. If anyone is curious about colors, I’ve found a Red Heart color called ‘real teal’ that works for his real color, if you care… But I think he would look cute any color. You can buy it at WalMart… Its the cheapest yarn you can buy, but it works really well for amigurumi and stuffies because its kind of stiff and holds shape fairly well. Mia, why do you reply to unnecessary questions and to the Spanish ones BUT NOT reply to the people that REALLY NEEDS your help? That’s really silly of you!!! I can’t seem to get the right number of stitches on the body after round 2, should the rounds be ending where they began or part way through the round before? Nevermind got it figured out :) Thanks anyways! I’ve got the same problem. Can you help me? Okay, so I’m just reading through the pattern and just curious as to if the al st join in each round is counted as a stich or no. <3 the pattern!! No it is not you will skip over the slst in each round. It’s there simply to help build height. 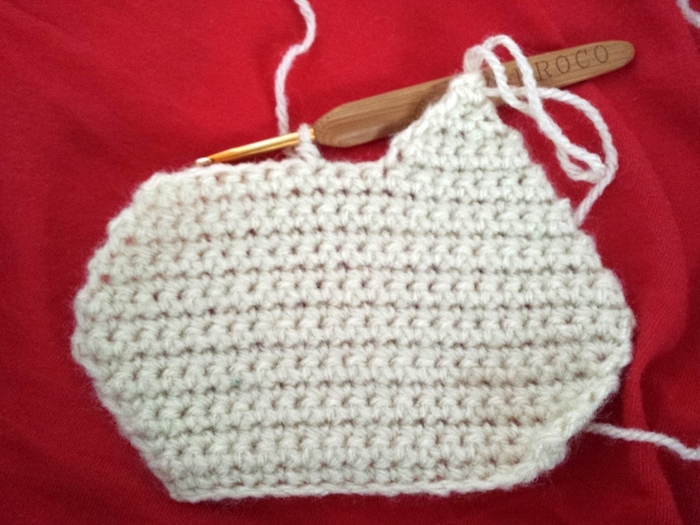 by stating i was a basic crocheter i was trying to say i cannot enlarge the small patterns.. Pretty much my entire family loves pokemon, even my kids and all the nieces and nephews. Snorlax is a favorite of a few of us mainly my older brother. I have been searching for snorlax designs in pretty much everything for awhile. I tried backpacks, pillows, stuffed animals, hats, crochet, polymer, several others. The crochet ones are usually small and im just a basic crocheter. The fact that this guy is huge im excited to try. It will take time between work and taking care of the kids and a sick husband but the look i know i will get from my older brother will be worth it all.. THANK YOU SO MUCH FOR PUTTING UP THIS PATTERN. First things first — I LOVE this pattern! I was looking for something special to make for my son for his 13th birthday (you know, something cute that a “teen” would still find cool) — and this is by far the best Snorlax pattern I’ve ever seen. It just captures his spirit so perfectly! So I’m still in the midst of making it (oops…his birthday was May 17 and I discovered your pattern only a week before that.) 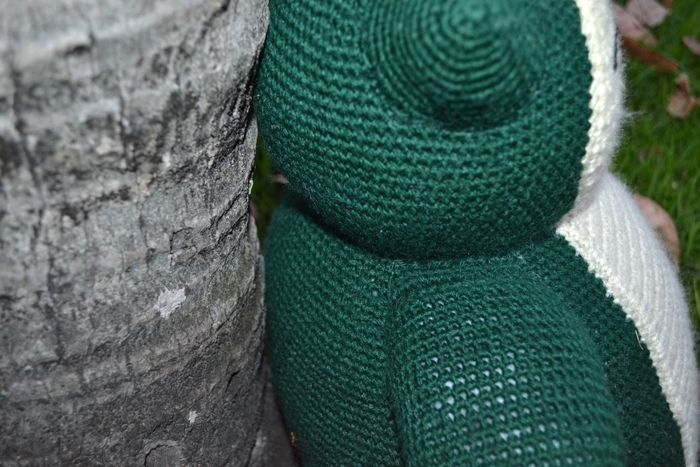 — partly because the yarn I used is very bulky and so I ended up using a 6.5mm hook for the body. I’m nearly done with the body, but as you can imagine it is HUGE. Appropriately Snorlax size, but still HUGE. I promise to post you photos when I’m done. My one problem, however, is that I’m confused about how you make the claws on the hands. I see from the photos that they are roughly cone-shaped, correct? Any advice that might help? I get the first 3 stitches in the magic circle just fine, but I can’t figure out how to get to the second row…. Thank you so much!! I’m sure it will be a great gift!! 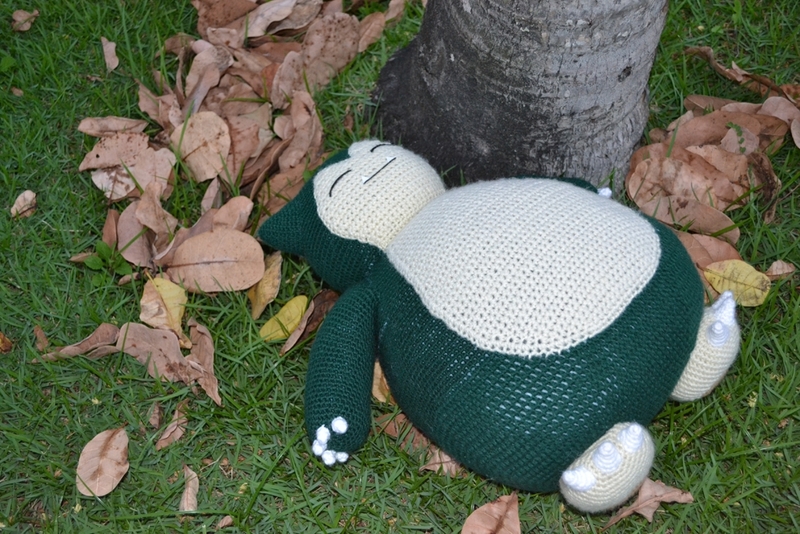 And, OMG, what a HUGE Snorlax you are crocheting!!! I’m really curious about that! Can’t wait to see your Snorlax, when you finish it. – and if there is a special kind of contact glue for crochet works or does any kind of glue work? I don’t suppose so..
As soon as you can answer me those questions, I can go buy all the stuff I need! Today I went to the store and bought everything I need. This is awesome! Thanks for sharing. However, I’m afraid that the size of this will make me go nuts. I need to see progress fast or I lose interest in the project.. Not sure whether I could do this one. How many hours do you think it would take an “average” crocheter to make this? Hi Tina! Thank you!! And yoy are welcome! ^_^ I’m not good into timing things :S I usually have no idea of how much time I will spend with anythjng, lol. Well, but I think maybe you will take around 35 hours? I don’t know for sure :S The most time consuming part is his body. I’m really struggling to get started with this as I don’t really understand the instructions. I’ve been looking all over the internet and in my crochet books and I just can’t figure it out. The first part after I’ve ch 30, am I supposed to join it back round to the first stich after the slipknot? And if so, I really really don’t understand the next part of the instructions and how it gets up to 60 stitches. So far I’ve spent 4 hours trying to figure this out and I can’t. I don’t suppose you could make it clear for a beginner to understand please? You have to sc around the 30 ch, as in sc on both sides of the chain. After you have chained 30 and start sc down the chain, the multiple sc in a ch are to help you go around; they help to form the corner. I hope that helps. I had trouble with that part as well and slapped myself when I finally figured it out. That’s it!! ^_^ Thanks for helping! Hi Lauren! Thanks for the compliment! Also thanks for your suggestion, I will try to make it clear to begginers. Well, his body starts with an oval shape. Please, watch this video to have some idea of how it works: http://www.youtube.com/watch?v=_B9BinO3ULg Now, that you’ve watched the video, I will try to explain the pattern xD First, you will chain 30 and then from the second chain from your hook you will crochet 28 sc. Now, you will crochet 3 sc in the same and last chain. After that, you will work in the other side of the chain, the bottom, as is shown in the video. Crochet one sc in each one of the next 27 ch. In the last chain crochet 2 sc. Now, slip stich in next sc. When you finish this round you will count a total number of 60 stitches. After I do the slip stitch from the first round and go to the second round, my yarn bends up and it doesn’t look right. Why do we have to slip stitch instead of just increasing like on the other end? I also have this issue! Omg thank you so much for putting this pattern up!!!! Hi Mia. I love the pattern. Thank you for the detailed instructions and hard work you put into making him. I don’t know much about Pokemon but I wanted to know if snorlax come in different colors.